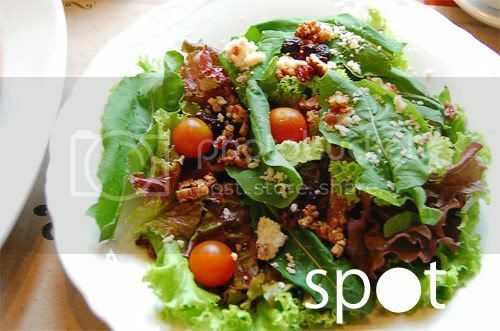 I had the most delicious salad at Mamou two days ago! I forget the name. Eversince I gave birth, my short term memory has been really bad. Anyway, just ask the waiter for the "Alukbati and Camote Tops" salad. My GOD!!! It's divine. Certainly an unexepected mix of greens but surprisingly their flavors blend extremely well together. Never in my wildest dreams did I ever think that you could eat Alukbati or Talbos ng Camote raw, much less as the main greens in a salad at an upscale restaurant. Friends, it is glorious!!! Heaven in the mouth! (no pun intended) The salad is drizzled with a mild fruit based vinaigrette which has just the right sweet-sour balance. Blue cheese gives a stark contrast to the flavors making it all the more interesting. The addition of boiled, diced squash and saba banana (which I personally don't really enjoy, but in this case, LOVE), adobo flakes is fantastic. It's something you have really got to try to appreciate. While you're at it, also order the Lorenzo's Oil Pasta. It's spaghetti with truffle oil infused cream sauce. Smells divine and tastes as good as it smells. Mamou's co-owner, Tita Annie, was also kind enough to have a chat with us outside over a few cigarettes. She is really nice and from the few minutes i spent with her, I could tell that she is also a very sweet but strong person. Anyway, she said that the next time we come back, we should try this salad. Again, I forget the name, but I remember that it is named after a specific wine rehion in Northern California. It has walnuts, cherry tomatoes and a cranberry vinaigrette. Can't wait to go back and try this! Mamou is known for their steaks but I have to say that everything else on their menu is also drool worthy!